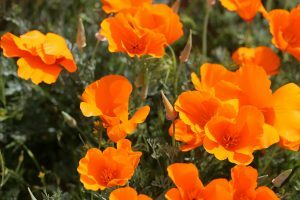 California Poppies – They’re Here! The poppies looked like they were glowing with their vibrant orange hue! Looking for something different to do this weekend? How about checking out the California Poppies in the Antelope Valley California Poppy Reserve? 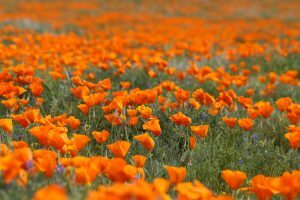 The poppies are in bloom and you only have a few weeks left to view them. 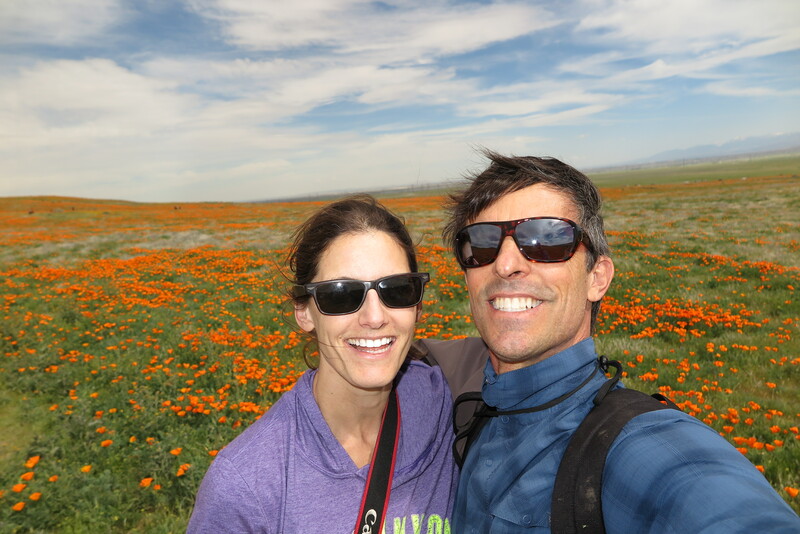 It was my first time visiting the Antelope Valley California Poppy Reserve a week ago. It was an easy hour and a half drive that allowed us to enjoy the rolling hills and farmland on the way. As we got close to the state reserve, there were poppies growing on the roadside. People were pulling over everywhere to spontaneously enjoy the poppies! But I wanted to get to the reserve where there was going to be a much larger expanse of flowers. The traffic came pretty much to a standstill as cars waited on Lancaster Road to turn into the reserve and pay for parking. We quickly realized it would be easier to park on the side of the road and walk into the reserve. It’s cheaper too! So even less of a reason not to make the trip! It was hot out there so we took our water and made the long walk into the park. And it was worth it! We feasted our eyes on a glowing carpet of orange. There were a handful of trails to follow. Picnic tables were available. And there was a small museum where you could learn more about… well, what else… the poppies. 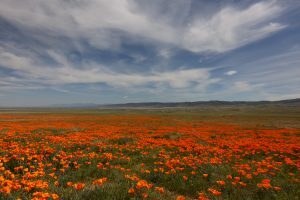 Wide angle shot of a field of California Poppies. Wide angle shot of a massive expanse of California poppies under a really cool sky. We headed to where we thought there would be the fewest amount of people and the largest number of petals. It was hard to avoid the crowds, but more importantly we avoided stepping on any flowers! We got lots of great photos and enjoyed the state flower. I will admit that I was on the lookout for rattlesnakes the whole time, but happy to report that I didn’t see any. Although now that I know that the rattlesnakes actually protect the poppies by killing all the rodents that would otherwise snack on the petals, I’m a new found fan of the rattlers. And apparently, rattlesnakes try to avoid people and use their rattler as a first alert system to let you know they’re there. Just give them space and they will slither away. It was a fun day with great weather to enjoy the outdoors and a beautiful landscape. My partner-in-crime was my on-again, off-again boyfriend and that’s a whole other story… but at least he knew about the poppies. He is handy to have around sometimes. Parking is $10 per car. There are other rates for seniors, handicapped, and buses. But you can also park on Lancaster Road for free and walk into the park. Other flowers include goldfields, lupine, and lacy phacelia. If you can get away during the week even better. The weekends are jam packed with visitors. There are eight miles of trails and areas that are paved to accommodate wheelchairs. The state reserve takes their poppies seriously so no tramping through the fields! There is a fine for killing any flowers. Leave Spot home. Only service dogs allowed. No tramping through the fields. It compacts the soil leaving it useless for new flower growth.